I thought I would write a review. I often don’t when food is really good. We decided to give this restaurant a try. I had heard good things about it. It didn’t disappoint. Went with my family. We all had something different and kept trying each others food. I can’t wait to go back and try something else. Everything was so good. Nice atmosphere, friendly service. Give it a try. We all loved our food. I am giving them four stars. Best Rehearsal Dinner Spot Around! 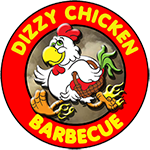 With the help of Justin and his team we hosted our rehearsal dinner of 29 people at Dizzy Chicken of Saratoga. The staff was extremely accommodating, the food was amazing, (impressed all of our many needs — vegetarian, no sugar, lactose intolerant, and keto folks) and the prices were incredible! Our guests loved the ambiance, and location. They even opted to stay after the dinner for a few more drinks, because they just couldn’t get enough of the place! I would recommend this place over, and over again. Go and experience it for yourself! Food, Service and Atmosphere are all AWESOME. You will not be disappointed. Sorry we waited so long to try it. On a lovely June evening, my husband, son and I enjoyed a delicious, bountiful and affordable meal with friendly and attentive service. This place is a gem! Please venture off Broadway and find your way into Dizzy Chicken for succulent chicken, brisket and pork with sides that will surprise you. With off-street parking, indoor and outdoor seating, and a terrific menu, this place has it all for meat eaters. In fact, even vegetarians will have a pleasant meal with the amazing Mac and cheese and roast veggies. I can’t wait to return! Just tried the Prospect sandwich for the first time, having ordered from Dizzy Chicken since it opened in Saratoga Springs, and I’d say it is the best sandwich I’ve ever had. The menu has such deep variety for those looking for quality cooking delivered with care that Dizzy Chicken is now the only place I bother to keep a menu for. Read the menu, follow your instinct, you can’t go wrong there. Highly recommend their catering services for large and small events. We’ve used them for events from 150 people to 25. The food quality, price , portion sizes and presentation are fabulous. They offer gluten free options as well. I’ve used several catering services over the years and it’s safe to say that this place is second to none. Something for everyone can be found on their menu and if not, just ask and they’ll create what you want. We really enjoyed our first visit and expect to return soon. Very good BBQ, priced right, nice rustic atmosphere, pleasant service and engaging owner. I wanted BBQ in the dead of winter, and it delivers. I went with the BBQ for 4 to get a good sample of the menu, and it did not disappoint. The brisket, pulled pork and chicken were all quite good, with the chicken eeking it out as the best. The sides were a good portion and tasty as well, I went with the corn bread, parmesan fries and mac and cheese. This might be my new favorite delivery restaurant in the area. If your sick of pizza or chinese, give this a go. My wife and I had dinner at the Saratoga Restaurant last night. Service was very good food was Outstanding!!!! We thought that the place was unbelievably clean and we loved the decor the wood built bar is gorgeous. We will be going back again and again!!! We were greeted warmly by a well dressed man, I’m assuming the manager/owner he sat us at our table and thanked us for coming in. I thought that was nice. The menu was great, they have vegetarian and gluten free options for my wife and everything looked so good it was hard choosing what to order. We both had a soup to start and she couldn’t stop saying how delicious the butternut squash soup was. My wife ordered the roasted beet salad off the specials menu and I got the pulled pork panini. By far the best panini I have ever had! They had a really good beer and wine menu as well. Riesling for her and Ithaca Flower Power for me. Very nice comfortable atmosphere, loved the fireplace and soft holiday music. Total bill was about $60 w/tip.